This is a quick and easy chutney. Goes well with idli, dosa, chapathi and pongal. Fine chop the chilly, ginger,shallots and garlic. Cut the tomatoes into big chunks. Heat the oil in a pan and add mustard seeds. Once it crackles, add the cumin seeds, coriander seeds, shallots, garlic, ginger, chilly, curry leaves and asafoetida. Saute till the shallots turn a bit transparent. Now add the tomatoes, salt and sambar powder. Mash the tomatoes with a ladle now & then. Once cooked, remove from flame, garnish with coriander leaves and serve. I used homemade sambar powder. You can use store bought ones also. 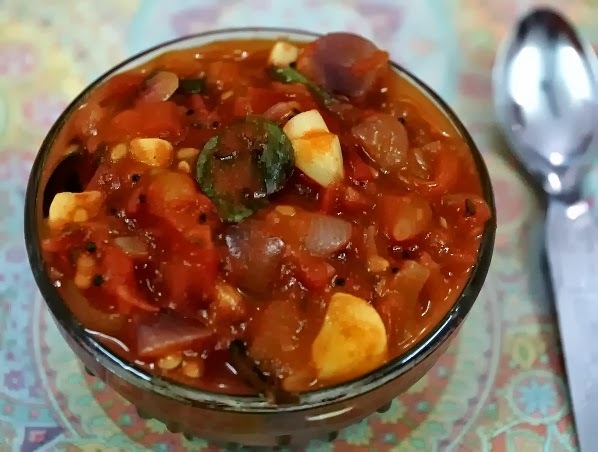 If sambar powder is not available you can use chilly powder also. But sambar powder enhances the taste. Linking to cookingforallseason's sidedish mela.